•Highest quality self-healing mats can withstand any type of cut. • Self-healing technology allows cuts to mend themselves allowing mat surface to remain smoother longer than standard mats. • Double sided so you can use the side that works best with your fabric colors and prolongs the life of your mat. 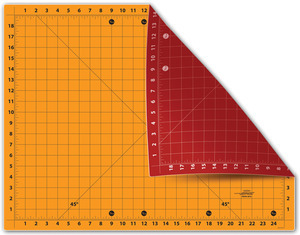 • For best results use with The Cutting EDGE Rotary Cutter and The Cutting EDGE Ruler.